Software needs to be built, tested, and shipped continuously for fast feedback. Developers want to know quickly if a change broke the system or not, so tight IDE integration is a must for any modern build system. In this issue of the newsletter, we will look at how Maven, Tycho, and Gradle can be used from inside Eclipse. The Mars Democamps are about to start! Check the list to see if one of them is hosted near you. EclipseCon France is only a month away! Be sure to register soon, space at the venue is limited. Eclipse & Gradle - The best of both worlds coming together. Discover all the build services Eclipse projects get to use for free! What you need to know about bringing Eclipse and Maven together through M2Eclipse. Company reaffirms its commitment to Eclipse open source tools and the new Eclipse Internet of Things open source community. Here are the final winners for the Great Fix. Thank you to everyone who contributed! 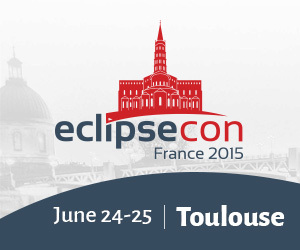 We're pleased to announce the program and keynote for EclipseCon France 2015, planned for June 24-25 in Toulouse.